Please note, this is archived content and is no longer being updated. Please update your bookmarks and links to point to this permanent URL: http://curation.cs.manchester.ac.uk/digital60/www.digital60.org/rebuild/goals.html. Figure 1. The Manchester Mark 1 prototype, circa April 1949. By late 1994, the 50th anniversary of the first program�s running was already on the horizon. Encouraged by CCS colleagues, I wrote a project proposal aimed at an internal audience, describing the steps required to build a replica of the SSEM in time to celebrate the jubilee. 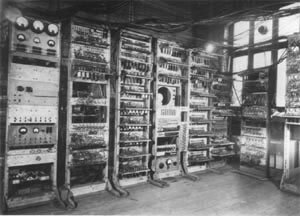 The target would be a machine as near-identical as possible physically and functionally to the original machine as it was on 21 June 1948, and able to execute the original program. The proposal made several gross assumptions: that it would be possible for us to find the old parts; that there was sufficient available detailed information from which to deduce the design as it was in June 1948; and that construction would be carried out by enthusiastic CCS volunteers, possibly with some paid-for structural metalwork. I did a substantial amount of preliminary investigation at this early stage to make sure that the idea was technically viable. A crucial source was a private notebook, belonging to Dai Edwards, containing numerous detailed circuit diagrams. Edwards had given a photocopy of that notebook to Tony Sale, who had passed it on to me. make the machine as authentic as possible. The proposal came to the attention of the University of Manchester�s Computer Science Department staff, who enthusiastically welcomed the idea because it chimed with plans they were already formulating to host a major conference to celebrate the 50th anniversary. At that point, professors Cliff B. Jones and Frank H. Sumner were proactive in getting the project recognized as something that should be done at the university. The Museum of Science and Industry in Manchester was also supportive at this proposal stage because it was foreseen that the replica should eventually be preserved in a museum. Although I had an ambition that the replica should go to London�s Science Museum, it became apparent that its more natural home would be in Manchester, the location of the original work, at the Museum of Science and Industry.